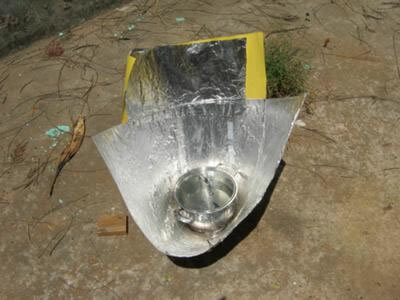 In continuation with my story of "Home-made solar funnel cooker", I would like to add my further experience. The cooking pot which is kept at the bottom of the funnel is quite critical for funnels.Since the focal line obtains as vertical line, I tried a stack of cooking containers.The middle ones heated up to high temperatures, but the top and bottom containers did not heat up so much. I tried a cooking pot with glass lid, but no covering with plastic bag or blackening outside.The temperature reached was 140 C and the boiling of rice was achieved in a short time of about 40 minutes at 12 noon, in Bangalore--latitude 13 N.
A large container 3 quarts with glass lid is a convenient cooking pot for a funnel cooker made with 42 in x 21 in cardboard.I also cook in glass jars with limited success. Thank you again for your contribution, this is great information. As usual you do a great job with explaining in great detail. I always like to receive your stories and knowledge about your solar cooking experiences. I have tried with black pots and also with plastic bags. The rate of heating is greater, but the highest temperature attained is about the same ,that is around 140 C.
Solar cooking in the tropics has the advantage of faster heating...the solar insolation is greater, may be around 1200 watts per square meter, but has some limitations...on many sunny days, cloud cover starts after 3 PM, and the process of cooking becomes difficult...so one has to watch the movement of clouds after 2 PM...Furthermore it gets windy too after 4 PM ,especially in coastal areas like Chennai. So the best time for solar cooking in the tropics is from 8 AM to 2 PM. I didn't realize how close you were to the Equator. Glad to see this design working out for you, I tried the funnel, and but had too much wind. If you have a darker pot and polycarbonate bag, I'd like to see how much faster you could get the water to boil. India is certainly getting behind solar cooking and energy. Union Minister Farooq Abdullah is a busy person these days.